Visit Bob Bell Chevrolet today and let one of our friendly sales associates tell you all about the BellCare Advantage.The BellCare Advantage is our way of saying “Thank You” for choosing us as your Maryland Chevrolet source for sales and service. When you buy a new or certified pre-owned vehicle from Bob Bell you can buy in confidence, knowing that your Bob Bell Chevrolet of Bel Air serviced engine is guaranteed for life. You’ll also enjoy free oil changes and tire rotations for the life of your vehicle.Contact us and schedule to test-drive a new Chevy today! And don’t forget to ask about the BellCare Advantage! With the first two factors in place, Chevrolet returned to the series in 2012 and promptly won back-to-back-to-back manufacturer’s championships and two driver’s titles. This year, Chevrolet-powered Verizon IndyCar Series race cars have a decidedly different appearance: they feature a Chevrolet-developed aero package, which was allowed for the first time under series rules. Chevrolet introduced its road-course aero kit to the media recently at Indianapolis Motor Speedway. “This new aero kit provides Chevrolet drivers the capability to enter and exit corners faster, while maintaining high speeds on the straights,” said Berube. With such a strong focus on speed and cornering, it was no surprise when the series’ teams got together for a preseason test at Barber Motorsports Park in Alabama, Will Power – the 2014 series champion and driver of the No. 1 Verizon Team Penske Chevrolet – recorded the quickest lap. Power covered the 17-turn, 2.38-mile course in 1:07.3118 (123.010 mph) as Chevrolets turned in the top six fastest speeds. “The Promoter Test at Barber Motorsports Park is always an exciting moment in the IndyCar season when our Chevy engineers get to see the fruits of their off-season labor in the hands of our Team Chevy racing partners,” Berube said. The first race of the 2015 Verizon IndyCar Series was March 29 on the streets of St. Petersburg, Fla. Chevrolet swept the top six finishing positions. For more information about the all-new Chevrolet IndyCar aero package, visit the GM Media Site. 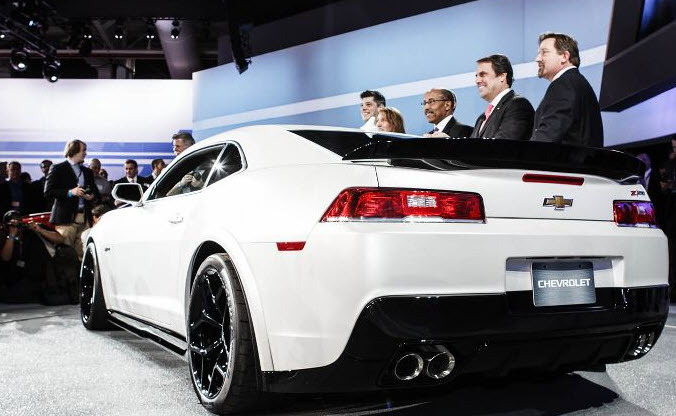 Chevrolet introduced the restyled 2014 Camaro line at the New York Auto Show, including the return of the Z/28, the most iconic model in Camaro history. A refreshed Camaro for the 2014 model year. Most importantly, with the new Camaro comes the resurrection of the Z/28 moniker, which will be powered by the amazing 7.0L LS7 V8 engine mated to a six-speed Tremec TR6060 manual transmission. This puts the output of the Z/28 at 500 howling horsepower, and 470 pounds-feet of torque, fitting perfectly between the 426 horsepower Camaro SS, and the 580 horsepower Camaro ZL1. In many track-oriented circles, the 2014 Camaro Z/28 is perhaps the most capable Camaro ever. Chevy claims that the 2014 Camaro Z/28 is an average of three seconds faster per lap than the more powerful ZL1. This is thanks to chassis revisions that allow the Z/28 to grip at up to 1.05 lateral G forces. Then there are the Brembo brakes, which provide 1.5G of stopping force. And last, but certainly not least, is the fact that the Z/28 is 300 pounds lighter than the mighty ZL1, thanks to several incremental tweaks, ranging from thinner rear window glass, to lighter wheels. And it still has its second row of seats. Inside, the Z/28 is treated with Recaro racing seats, a flat-bottom steering wheel, and seat cut outs that seem ready for five-point harnesses. 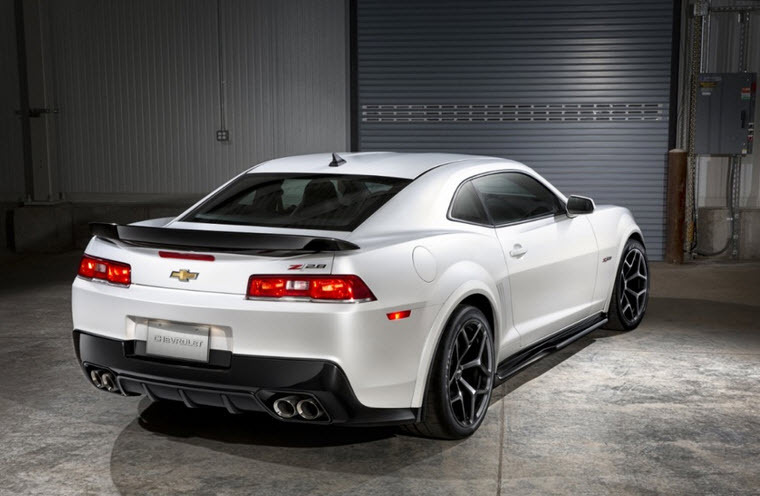 To keep the Z/28 stable on the track, it features a full aerodynamic package consisting of a front splitter, underbody panel, fender flares, extended rocker panels, and a rear spoiler and functional diffuser. 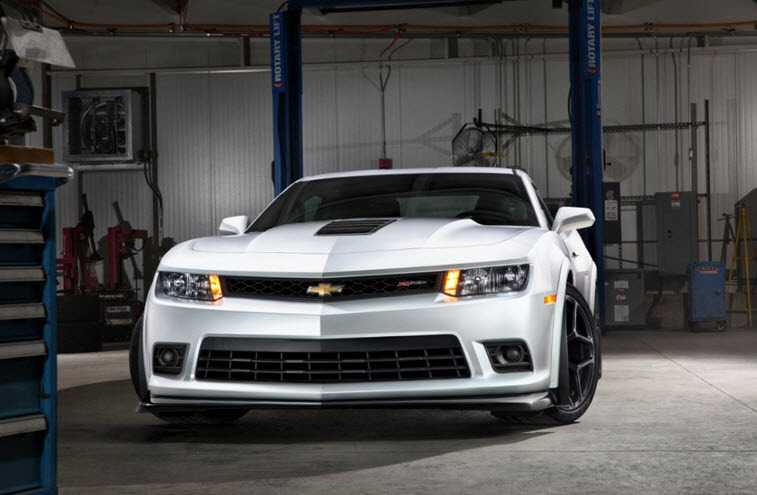 The 20-inch wheels used on the SS and ZL1 were swapped for 19-inch wheels, which reduce total unsprung weight by a total of 42 lb and lower the car’s center of gravity 33 millimeters. Rather than utilizing different-sized wheels and tires front to rear, all four corners of the Z/28 are shod with 305/30ZR-19 Pirelli PZero Trofeo R tires — the ultra-high-performance tire’s production debut — that are believed to be the widest front tires on any production car. In the introduction to a January 2009 BusinessWeek excerpt from his book “What Would Google Do?,” author Jeff Jarvis extolled the idea that the Detroit automakers should start releasing cars in “beta” form, much the way the Silicon Valley tech giant had been doing with its software products. Despite the obvious dangers of open public beta testing in the car business, it seems that a number of automakers, including Tesla, Fisker, BMW, Ford, General Motors, have been doing exactly that to varying degrees over the past several years. The concept of structured alpha and beta testing of software has its origins with IBM. Back in the 1950s, the computing pioneer defined alpha testing as the internal product verification before a public announcement. Beta testing was the verification of the product by users before it got released to production. Until Google went all-in on publicly releasing software that was labeled as beta in the past decade, beta releases were mostly restricted to select groups of testers who committed to providing regular feedback about problems in the product. Google’s GMail was the stereotypical example of an open beta, retaining that status for more than five years from its initial release in April 2004 until July 2009. In the automotive realm, with a few notable exceptions, manufacturers have generally kept their equivalent of beta testing strictly in-house, using engineers and test drivers to evaluate new vehicles and systems. Even the final stage of evaluation before vehicles go on sale to the general public has been restricted to employees. For example, at General Motors, anywhere from several dozen to several hundred production-representative examples are distributed to managers and other employees in the final months before the on-sale date in what is known as the captured test fleet. Perhaps the best-known early example of a public beta test in the car industry was the Chrysler Turbine car program. Between 1963 and 1965, Chrysler built 55 turbine-powered coupes and loaned them to more than 200 drivers around the United States for three months at a time to gather real-world data and driving impressions. When automakers make it clear that they are running a test program like Project Driveway or BMW’s EV evaluations, customers can go in with their eyes open and know that they might experience some problems. Even if customers pay for the privilege of participating, they probably won’t mind, and the engineers can learn a lot. On the other hand, when paying tens of thousands of dollars for a regular production vehicle, mass-market customers expect it to work from the start, whether they are buying from startups like Tesla and Fisker or century-old stalwarts like Ford, GM, or BMW. Every one of these companies regularly market their new technologies as features that will make customers’ lives better, but sometimes they don’t. Perhaps the solution is for auto manufacturers to develop ways to do more real-world beta testing of new technologies so they can find out what doesn’t work before they commit to production, making sure everyone involved knows exactly what to expect.